Offering you a complete choice of products which include sports floor paints. 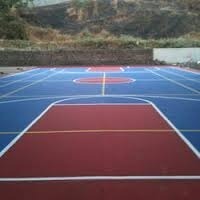 Being a quality-oriented firm, we are engaged in offering an exclusive range of Sports Floor Paints. Our paints are applied after the scrub vigorously with the wire brush to remove algae, fungus and moss growth especially on surfaces prone to water stagnation. Proceed by using quality approved basic components, these products are highly demanded due to their long shelf life and optimum quality.